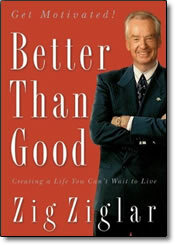 Better Than Good – CDs by Zig Ziglar – Discount! He is “the” premier motivational communicator, having inspired millions worldwide with his stirring seminars and top-selling books. But this time, Zig Ziglar offers up an audio book that cuts deeper and burns brighter than any success book before it–one that transcends even his own previous work, and challenges you to new levels of excellence and achievement. On the topic of living a life of motivation, passion and peak performance, nobody knows it better than Zig, and nobody tells it better than Zig. Spoken in his trademark style, this signature audio isn’t just about success now, excellence tomorrow, or even motivation for the next month, but about long-term results based on the time-tested skills, values, goals and attitudes that really work. He also presents, for the first time, the secrets he has recently discovered for getting–and staying–motivated your whole life long. Better Than Good is about making a lasting impact–an impact that goes beyond financial gains and creative partnerships. This audio seminar offers practical and spiritual vision for what life can be when we allow the power of purpose and passion to permeate our souls. This is the very best of Zig, brought together in one volume to help you be all you can be. Listen as America’s mentor instructs and inspires you to create the better-than-good life you were meant to live.